Throughout the month of October, I will be featuring products with proceeds going toward various breast cancer awareness charities. A blend of grapefruit, clementine and pomelo wafts delicately through the air, leaving behind an aroma so sensuous and delicious, it's tough not to pick the Archipelago Botanicals Ribbons of Love Travel Tin up and eat it. Seriously, it smells amazing. 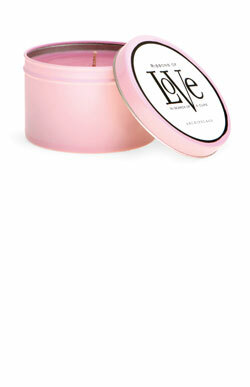 The pale pink tin looks beautiful atop any vanity or coffee table. And it burns for around 55 hours! Archipelago Botanicals will donate 50 percent of web sales to The City of Hope. Note: This candle is no longer available.